Size: Male up to 2" (5cm), female smaller. Tank setup: Planted tank, with rock or bogwood caves and sand or fine gravel. 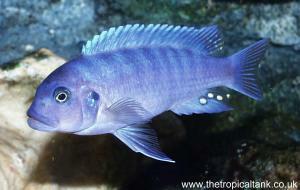 Compatibility: A generally fairly peaceful cichlid, but they will become territorial when spawning. Water chemistry: Soft and acidic, pH 5.5 - 6.8 preferred. 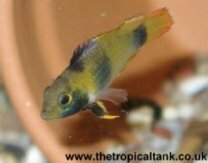 Although the fish are more likely to look their best and breed in their preferred water, they will usually adapt to slightly harder alkaline water in the aquarium. Feeding: Omnivorous: Should take dry foods, but live or frozen foods such as bloodworm, brine shrimp and mosquito larvae will be preferred. 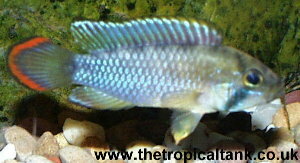 Sexing: Males are larger and have a blue colour sheen and a red-edged tail. 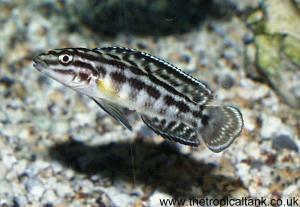 Females have a distinctive yellow colouration with black blotches, resulting in the common name of Panda dwarf cichlid. 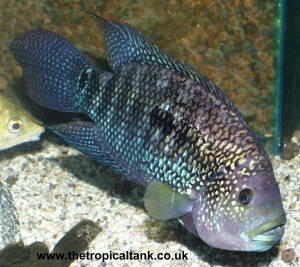 Comments: A colourful dwarf cichlid with the male and female providing different but distinctive colouration. 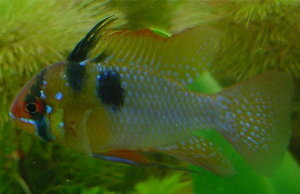 Another attractive species, Apistogramma pandurini, looks quite similar.